If the weather we are currently experiencing is anything to go by we may well have by passed Spring moving straight onto Summer from Winter. That’s not to say that our desire for comfort food has disappeared with it. 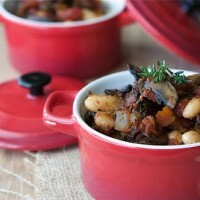 YTF member and founder of Taste Cafe in Pretoria graciously contributed this hearty recipe- comfort food at its best!! To quote Willie, ” Ragoût is just the fancy chefy name for a stew and traditionally it contains cheaper cuts of meat and would be cooked very slowly for a long time. But, we use canned beans and a soft fungus like mushrooms so we don’t need long cooking hours, you’ll need about 20 minutes to cook this. A great energy saver. Drain your beans and keep aside. Soak the dried mushrooms in the water and keep the water. Fry the onion and garlic till soft over a low heat. Once soft, add the mushrooms and fry until they have shrunk. Add the thyme, rosemary, nutmeg and wine and allow the alcohol to cook off and reduce by a third. Add the Mushroom water, tomatoes, puree and cream and bring to a soft simmer. Add the beans and black pepper and cook for about 10 minutes or until it has reduced and thicken. 5 minutes before serving, taste for salt and add if you need more. Do not add salt in the beginning as salt tends to toughen beans. Fry onions in olive oil and in the first 50g of butter. Add the barley and stir around in the pot until it has been covered by the oil and butter and started to take the heat of the pot. Add the wine and allow to cook off. Now you going to use the vegetable stock and add a soup laddle full at a time, allow it to cook off and add another until you have used all of it. But you have to stir the barley constantly in order to develop the gluten and make it sticky and creamy. This takes about 20-30 minutes over a high heat. I know it is a lot of work, but it will be the best barley you have eaten in your life! Once you have used all the stock, the barley whould be puffed and soft and slightly sticky. If still hard, use more stock or water. Add the cream and second 50g of butter while stirring the whole time. Add the parmesan and peas and stir well. Taste for salt, it should not need more as the stock and parmesan will add enough salt. If the barley is too dry, add a little more cream and water. Serve with the Bean and Mushroom Ragoût and sprinkle fresh basil leaves over.